We are now into our second week of 365 days of orchids and to add to the diversity here is our wonderful bright pink clone of Phalaenopsis violacea. This Malaysian species has been used heavily in breeding long lasting colourful hybrids and you can see why. The species produces flowers successively on a spike over many months and so this could appear anywhere in our 365 days but today it is looking particularly bright in the winter light. 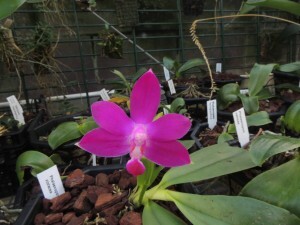 We grow this plant in Warm Asia (min 16C) in a basket for good drainage but watered frequently. The plant has enjoyed being repotted recently by Jacob.